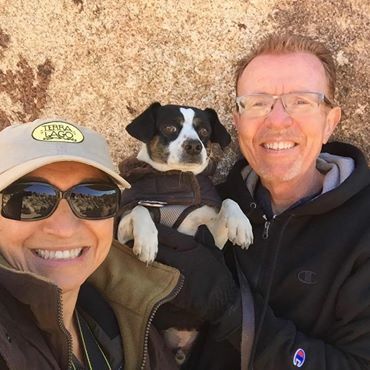 Hello, my name is Michael Green and this is a recent picture of me along with my wife Laura and our dog Buddy. Laura & I have been selling online since 1996, when we started with Yahoo auctions . It began with us selling unwanted items around the house such as clothes, purses, books and audio programs , just about anything that we could find. We started selling part time on eBay in 1999 and since 2001 we have made our living selling on eBay, Amazon & our own web site. We are located in La Quinta California, La Quinta is a community nestled at the base of the majestic Santa Rosa Mountains, just 30 minutes from Palm Springs, in Southern California's Coachella Valley. Quality products, accurate descriptions, competitive prices & FAST shipping are what you can expect from Desert Outlets.